Waterline Marina Resort & Beach Club is Now Open! Waterline Marina Resort & Beach Club has officially opened its doors Wednesday, November 29th on Anna Maria Island! Our coastal chic resort features 37 guest rooms and suites, each conveying the island lifestyle that is present on AMI with a modern touch.The spacious living areas in the suites are accompanied by a sprawling balcony and breathtaking views of the marina and surrounding island. 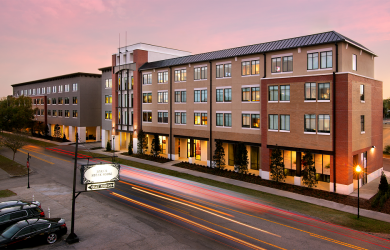 Suites also feature full gourmet kitchens complete with top of the line appliances, utensils, cookbooks and coffee and teas. Old-Florida charm can be found throughout the stylish rooms. Waterline’s unique location within Anna Maria Island is certainly worth noting. The full-service resort sits on the edge of a 50-slip marina, with views of boats passing along their way into the gulf waters. 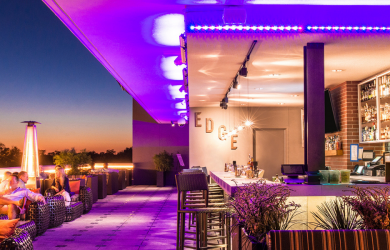 From the mangroves across the way, to the quiet moving boats and flying fish in the marina, the active waterfront provides Floridian-style entertainment that pairs best with sipping cocktails by the pool. Eliza Ann’s Coastal Kitchen is off with a bang! 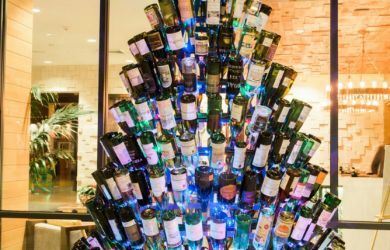 The Southern, coastal menu features small plates such as Fried Green Tomatoes with jalapeño remoulade sauce and Blue Crab Hushpuppies while boasting entrees including Wood-Grilled Sea Scallops and Pecan Crusted Snapper. 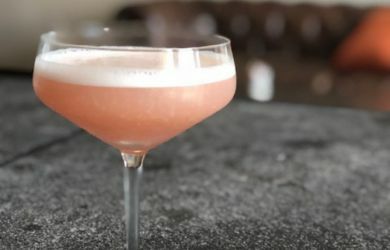 Eliza Ann’s also features a full bar with signature cocktails, wines and beers. There is no shortage of activities at Waterline Marina Resort & Beach Club. Take in the Old-Florida charm of quaint Anna Maria Island by bike on our complimentary beach cruiser bikes available in adult and children sizes. 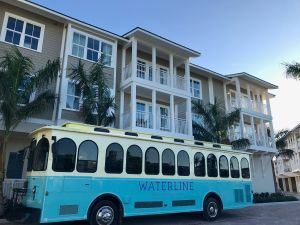 Take a short ride on the Waterline Trolley to the guest’s only Beach Club where umbrellas and chairs are available to rent. This little slice of heaven on Holmes Beach will not disappoint. Order one of our curated coolers for your beach or boat day, customized to your liking! Book an eco-tour, discover the sea life on a guided fishing excursion or channel your inner-artist through the rotating events calendar. 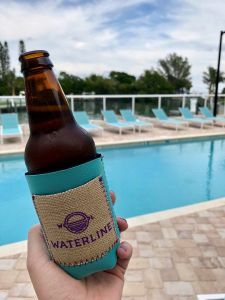 Our crew is elated to open our doors to the public and share the Anna Maria Island experience with you, Waterline style.